It's Time For Apple Watch - Where can you get one? Anytime Apple announces, and then holds, a keynote address it takes the world a little bit by storm. Apple trends on Twitter, tech and other news websites all but shut down to live blog the event, and tech geeks drop everything they’re doing to see what Tim Cook and company have to stay. Let me just say that this event shed light on more than what I was expecting today, which primarily was just when I could get my hands on my very own Apple Watch. There’s always some crappy comparison between Tim Cook and Steve Jobs at these types of events, and that’s totally unfair. I’ve already read today the usual “well, he’s no Jobs” from the usual sites, and it’s just time that stopped. Clearly, with today’s announcements and revelations, we have moved past the days of Jobs. Although his spirit is still very much alive in the creativity and innovation we see in the products the company continues to roll out, it’s just time. Cook began today’s keynote touting Apple’s in-roads to China with an incredible video of a new Apple store in West Lake, featuring a new design for their retail space. Cook revealed that in the last six weeks alone the company had opened six brand new retail locations in China, bringing the country’s total to 21. Cook expects that total to be at 40 by only next year. With 453 retail locations worldwide, and those retail locations racking up 120 million customers in the last quarter, Apple retail is an incredibly strong part of the company. Apple TV was the first order of business today. Apple TV continues to be a growing part of the Apple ecosystem, and today the company took that a step farther by announcing that Apple is the exclusive launch partner for the long-rumored HBO standalone service, titled HBO Now. HBO CEO Richard Plepler was on hand to debut the service, which will be available in April for $14.99 a month. Plepler also debuted a new trailer for Game of Thrones, which you can see here. Cook also announced a price change for Apple TV, lowering the device from $99 to $69. Cook rolled into more stats, with iPhone. Apple has sold more than 700 million iPhones to date, making it the #1 smartphone in the world. Cook also announced the customer ratings for both iPhone 6 and iPhone 6 Plus is a ridiculous 99% satisfaction. Apple Pay has added a huge number of retail supporters — even Coca Cola has upgraded some new vending machines to offer Apple Pay services. Cook also announced that every major car brand has committed to deliver Car Play to upcoming newer models. iPhones and their relation to medical research were a major talking point in the keynote, as Research Kit was announced. Research Kit was designed to help researchers turn iPhone and Health Kit into diagnostic tools; using iPhone users as a sample base for scientific research through apps. Available today in the app store are five new apps developed with Research Kit, aimed to sample Parkinson’s, diabetes, heart health, asthma, and breast cancer patients. What’s even greater is that Apple has restricted itself from seeing the data, as it’s all sent directly to developers. Research Kit will also be open source. In the notebook department, Cook revealed what he called a “reinvention of the notebook.” The all new 12″ Macbook weighs only 2 lbs., making it the lightest and thinnest Apple notebook yet. It’s also the world’s most energy efficient notebook. It also is the first fanless Macbook, reducing the insides of the notebook’s processor, featuring totally redesigned batteries and a new full size keyboard. The new Macbook starts at $1299, with updated storage takes the price to $1599; ships April 10th. The fanfare leading up to the event was all about Apple Watch; when could you get one and how much does one cost? Those were the biggest questions everyone wanted answers to. Cook rehashed all of the specifics of the watch, and we even got to see another demo, but the bottom line was pricing and dates. You can preorder Apple Watch on April 10th. Apple Watch will be available for purchase without preorder on April 24th. Those are the Apple details! Are you excited about the announcements today? 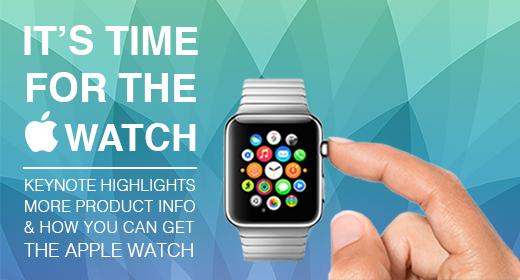 Let us know if you’re getting an Apple Watch, or why you aren’t getting one in the comments below! Have you listened to our latest episode? It’s all about Rock Band! Listen to the episode here! So HBO Now will only be on Apple TV at launch? HBO Now is an Apple Launch Exclusive, so not just Apple TV, but Apple and iOs devices. Jaspreet Singh Banwait liked this on Facebook. Marios Theodorou liked this on Facebook. John Ciocca liked this on Facebook. Carlos Rodriguez liked this on Facebook. Timothy Jones liked this on Facebook.